I’m now on my fourth day off as we nestle in among the snow. Our Valentine’s Day was pleasant, if somewhat uneventful. Most of the weekend was spent keeping warm, which is generally fun when you have someone else and a whole lot of blankets. I had the presence of mind to put together a batch of frozen scones on Friday evening so I popped two of those out in the morning and baked them. I brought them up with some coffee for Boyfriend and a pot of rose Earl Grey for me. It seemed appropriate to the occasion. Thoroughly fed, we considered the day. I gave Boyfriend his gift, a new board game, and he told me mine would be on the way. And we decided to go out for a brunch a bit later. We decided to go to our favorite brunch spot, which serves chicken and waffles in a quaint, European-cafe-style atmosphere. I had a lavender soda and we shared some appetizers before getting two plates of chicken and waffles. It was way too much food, but we boxed it up, along with an order of macarons. That left me a nice snack for tea time and us some leftovers for dinner. From there, we settled in for a cold, snowy evening together. Sunday was a day of high winds. 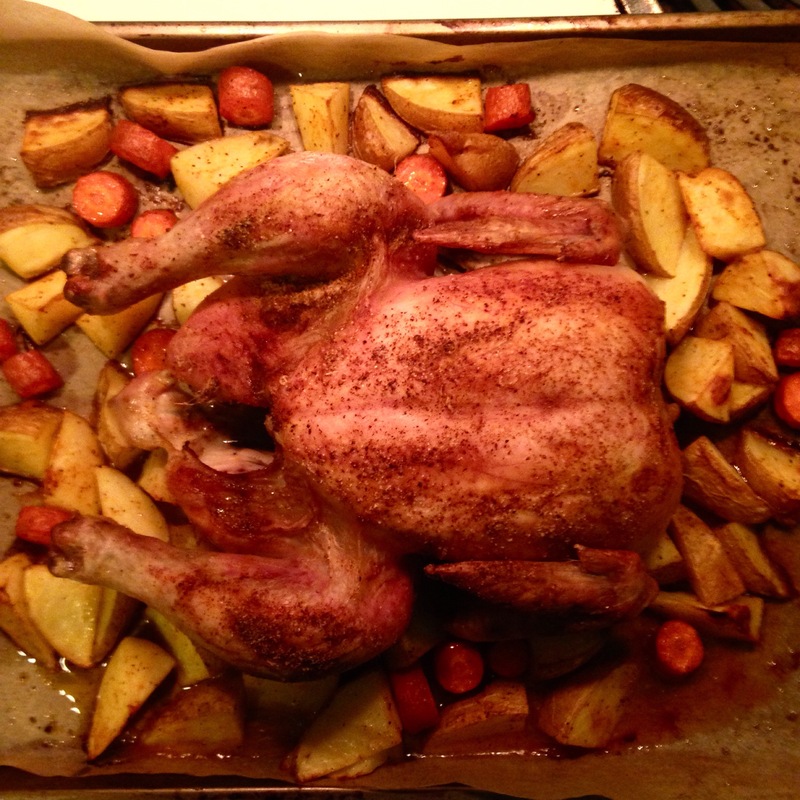 We decided not to venture out, beyond a quick trip for groceries, so I made a roast chicken for dinner. I seasoned it with a blend of salt, pepper, poultry seasoning, and paprika, and surrounded it with a bed of root vegetables, which roasted and soaked up all the delicious juices. 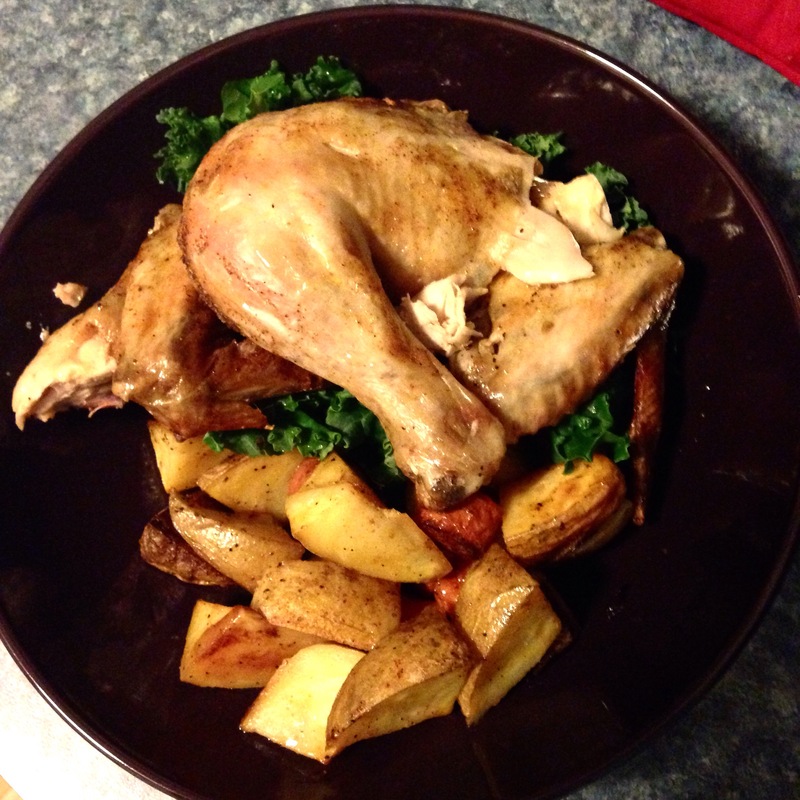 Served with a bit of steamed kale, it was a perfect healthy dinner on a cold, windy night. Monday was to be another holiday, so I enjoyed my relaxation and looked forward to my long weekend. Little did I know how long it might be! What a scrumptious Valentine’s Day feast. Everything sounds lip-lickingly lovely, but the lavender soda in particular caught my attention. Yum!!! I’m a huge fan of just about anything lavender, be it edible or merely scented (likewise for roses, violets – most flowers, really). It was really a lovely soda — not too floral, and just slightly sweet. I’m really tempted to make a lavender syrup to go along with my rose syrup sometime!